1.1 VCoPs: What are these? In the literature, there is not yet an agreed definition of a CoP. There is even some degree of contradiction, especially in relation to CoPs supported by ICT (VCoPs). This difficulty is due to the fact that CoPs are more than a concept, they are a learning process (Kirschner and Lai 2007, p.128). The term Community of Practice was used for the first time by Lave and Wenger (1991) to characterize, “(…) a system of relationships between people, activities and the “world”, developing with time and in relation with other tangential and overlapping communities of practice” (op. cit., p.98). Since this first definition, others have been advanced, taking into consideration the organizational context. One of these definitions is proposed by Hara (2009), who states that CoP are: “collaborative informal networks that support professional practitioners in their efforts to develop shared understandings and engage in work – relevant knowledge building” (op. cit. p.118). In the scope of this study, a CoP must be understood as: A self-organized group of people who are motivated by common interests related to their daily practice; this group is self – organized, with the objective of developing knowledge and improving performance, by interaction between its members. As for the identification of a VCoP, since the means of communication is not important, when defining a CoP, we will consider that the VCoP is similar to a CoP but communication is usually by electronic means. They contribute to innovation – knowledge, experience and ideas are exchanged and debated; these are critical elements for innovation; VCoPs can be described as virtual spaces where learning takes place. 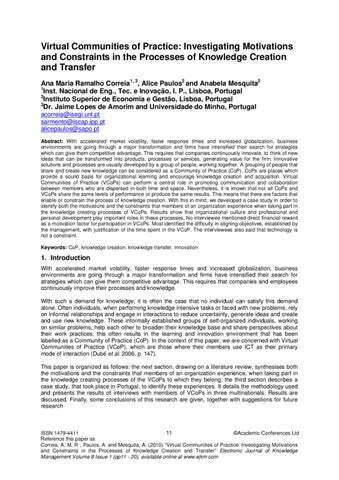 However, learning and innovating are closely related to practice; since learning is required for innovation to take place, these VCoP structures are ideally suited for the development of innovation activities and incremental innovation. Ana Maria Ramalho Correia, et al. Access to information and to specialists in a certain field – this is another factor often referred to in the literature (Wasko and Faraj 2000, p.169). Organizational culture – the involvement of workers in the process of knowledge development is conditioned by cultural factors; a culture that motivates and rewards knowledge sharing creates advantageous conditions for the development of knowledge creation. Technological factors – among the constraint factors associated with technology, non-verbal communication (e.g. visual cues, rituals), so essential to tacit knowledge sharing, is not available to a VCoP (Krogh and Grand 2002). Technology should therefore allow members to socialize, be user-friendly and offer an assessment of the “health” of the community (e.g., number of registered members, number of active members, number of knowledge artefacts created and their production dates) (Preece and Maloney-Krichmar 2003, p. 25). Phase A - comprised the non-structured interviews (Flick 2005) involving the leaders of VCoPs, with the objective of refining the theoretical model developed from the literature review, by application of a questionnaire. This also served to characterize the VCoP under study (Dubé et al. 2006). Interviews were conducted via e-mail, since we were not able to arrange interviews faceto-face; according to the literature, this does not compromise the results of the study (Jansen et al. 2007). Seven people were interviewed in this phase. Phase B - comprised the semi-structured interviews (Flick 2005). Its framework was developed using the theoretical model of the previous phase and involved the members of a VCoP. Its objective was to verify the framework, as it related to the motivations and constraints felt by the members. Data was gathered by both face-to-face interviews and through instant messaging. The first method was preferred because it allowed personal contact. The second was necessary to accommodate the timetables of the interviewees; again, according to (Fontes and O’Mahony 2008, p. 2 4) this is an adequate method to collect data without jeopardizing the validity of the study. The description of the research process and design can be seen in figure 1. 3. Data analysis and discussion of results In the next section the collected data is presented and discussed. First we present the results for the category of motivating factors and then the constraining ones. “No, in the VCoP there is no innovation. When there are new ideas or new problems in the community we discuss it in the face to face meetings that we have monthly. Sometimes, there is innovation” (interview 1A). When we tried to clarify the reason for that answer, the interviewee replied: “Innovation is a process that demands time, concentration in that specific activity as well as direct contact, which is not possible in the VCoP”. (interview 1A) Another interviewee, in phase A, also thought that, although innovation is the objective, it does not happen very often, as this quotation illustrates: “But the true value comes from adapting what's available and using it to really innovate. This is not the most common use of these resources but I think it is the one that makes a difference. By doing this, individuals can make the most of what the community has to offer” (interview 1D). From these interviews, it emerges that rewarding factors are only symbolic in nature; information dissemination about the existence of the VCoP, its activity and recognition of its merit, in particular the emphasis on international recognition, is sufficient. These results confirm previous research (Hall 2001; Wasko and Faraj 2000). The problem of arranging face-to-face meetings was also pointed out and is an important motivation issue regarding involvement in participation in the VCoP. As an example, one of the interviewees answering the question, “Does the organization encourage you to participate in the VCoP?” replied, “Yes, completely” and indicated ways of in which the company encouraged its staff with face to face meetings: “On the last Friday of each month, we have a meeting with all the collaborators of the [name of the organization] called [name of the meeting], where we share any information that we might think is useful” (interview 2B). We also found in the statements of the interviewees the mention of reciprocity as a motivating factor, to participate in collaborating acts in VCoP, as illustrated by this: “I know what it feels like to need help and so I answer” [he is referring to questions placed by the community by other members]. I also obtain answers. It is cultural” (interview 2B). people I work with, but I have seen it a couple of times in a distant past. Could be part of a normal change - resisting process that has now ended” (interview 1A). Some constraints have also been identified, in aspects related with culture and organizational issues, which limit the sharing, reuse and creation of knowledge in the communities. One of those concerns the lack of recognition, by the management, when sharing and making available information and knowledge. Another constraint relates to the lack of knowledge concerning the existence of a VCoP in the organization. Yet another is the fact that, when members of the community feel they have nothing new (and nothing of value) to contribute, they are reluctant to participate in knowledge sharing. Organizational culture may be responsible for the reuse of existing artifacts, rather than welcoming new ways of doing things, as highlighted by the following response: “Individuals are strongly encouraged to reuse all kinds of work artifacts, maybe even more than they are encouraged to contribute” (interview 1A). Another inhibiting factor is the lack of opportunity to participate, because there might be no one asking for help in the area in which members work. Knowledge creation and sharing depends, mostly, on the requests for help or clarification from a third party, as illustrated, “the reason is that, when we have consultations, we are clearly looking for the resolution of technical problems for which there is a direct answer. The exchange of ideas is rare because it concerns more conceptual problems and these situations are even rarer. Communities also do not give that kind of answer in the same direct way as is given in the first case. That is why there is a tendency to have a consultation; in the second case, this consultation is not so frequent” (interview 2A). Some cultural differences and literacy difficulties, due to the fact that all members do not have the same mother language, have also been pointed out. In terms of intangible factors, interviewees said that there is a natural human tendency to use existing knowledge artifacts since “using” new ones takes extra time and effort, as the following quotations highlights, “There's a natural tendency for just using what's available, to transform it; innovation takes time and additional effort” (interview 1D). This point only emerged in data gathered from the interviewees; it does not appear in the literature. Another barrier relates to the characteristics of each member; readiness to learn will vary from person to person, as this quotation illustrates: “It takes time to learn, and not everybody will be able to achieve the same level.” (interview 1D). The technological aspects have been widely referred to in the literature as constraints preventing an active involvement in the communities. Within this category there are the problems related to the difficulty of access to the community. This manifests itself in slow response times, poor web design, the lack of tools to extract information efficiently and tools that are difficult to use and not adequate for the knowledge sharing process. These factors are so important that one of the interviewees considers that technological limitations are the only constraint to knowledge sharing: “For me, at a personal level in terms of willing to share, there are no barriers, just lack of tools / systems allowing the keeping and gathering of knowledge in an easy way while ensuring that it is always updated (the personal contact with other members is not always possible, efficient and effective)” (interview 1F). people’s involvement in VCoP is organizational culture, namely, the recognition which the organization gives to contributions made by collaborators and the guidance provided, in the sense that people should help each other in order to solve day-to-day problems. This study also discovered that there is a greater predisposition of the members to obtain or even make available information, rather than being involved in a) knowledge creation activities, b) collaboration or c) innovation. Interviewees see these communities mostly as a means to obtain the necessary information and knowledge to solve daily problems. Collaboration is also present but they consider that as of lower importance; they do not have enough time and / or experience to contribute their knowledge to the community. As for innovation, the interviewees do not consider that this happens within the community to which they belong, because they see their VCoPs as more operational. Besides, they consider the process of innovation as something complex and demanding more interaction between people, aims that can only be attained by face-to-face meetings. Another important result is the fact that no interviewee said that extrinsic or direct rewards, such as salary increases or monetary prizes were necessary inducements to get involved in the VCoP. As for the influence of technology, maybe because the enterprises under study were all from the IT sector, none of the interviewees referred to this factor as motivating or constraining, although one commented on the lack of user-friendly ICT. How to use existing knowledge in the VCoP, to enhance organizational memory and improve the process of making decisions and generation of competitive advantage. Note: Space limitations meant that the full results of the literature review could not be included; they are available separately (Correia et al., 2009). References Ardichvili, A., Page, V. and Wentling, T. (2002) “Motivation and Barries to Participation in Virtual Knowledgerd Sharing Communities of Practice”, Paper read at 3 European Conference on Organizational Knowledge, Learning and Capabilities (OKLC), Athens, Greece, 5-6 April. Coakes, E. and Smith, P. (2007) "Developing Communities of Innovation by Identifying Innovation Champions", Journal of Knowledge and Organizational Learning Management Decision, Vol. 14, No.1, pp 74-85. Correia, Ana Maria R., Paulos, Alice, and Mesquita, Anabela (2008) "Comunidades de Prática: factores críticos de sucesso para a inovação e a partilha de conhecimento", Paper read at the 8th Conferência da Associação Portuguesa de Sistemas de Informação – CAPSI, Instituto Politécnico de Setúbal, Setúbal, Portugal, October 2008. Dubé, L., Bourhis, A. and Jacob, R. (2006) "Towards a Typology of Virtual Communities of Practice", Interdisciplinary Journal of Information, Knowledge, and Management, Vol. 1, pp 69-93, [online] http://ijikm.org/Volume1/IJIKMv1p069-093Dube.pdf. Flick, U. (2005) Métodos Qualitativos na Investigação Científica, Monitor, Lisboa. Fontes, T. O. and Oâ&#x20AC;&#x2122;Mahony, M. (2008) "In-depth Interviewing by Instant Messaging", Social Research Update, Spring, Vol. 53, pp 1-4, [online] http://sru.soc.surrey.ac.uk/SRU53.pdf. Hall, H. (2001) "Social Exchange for Knowledge Exchange", Paper read at the Conference Managing Knowledge: Conversations and Critiques, University of Leicester, 10-11 April, [online] http://www.soc.napier.ac.uk/publication/op/getpublication/publicationid/321908. Hall, H. and Graham, D. (2004) "Creation and Recreation: Motivating Collaboration to Generate Knowledge Capital in Online Communities", International Journal of Information Management, Vol. 24, pp 235-246. Jansen, K. J., Corley, K. G. and Jansen, B. J. (2007) "E-Survey Methodology", [online], http://www.igiglobal.com/downloads/excerpts/reference/IGR2920_WGMaaAObRD.pdf. Kirschner, P. A. and Lai, K.-W. (2007) "Online Communities of Practice in Education", Technology, Pedagogy and Education, Vol. 16, No.2, July, pp 127-131. Krogh, G. V. and Grand, S. (2002) "From Economic Theory toward a Knowledge-Based Theory of the Firm" in Choo, C. W. e Bontis, N. (eds. ), The Strategic Management of Intellectual Capital and Organizational Knowledge, Oxford University Press, New York, NY, pp 163-184. Lave, J. and Wenger, E. (1991) Situated learning: Legitimate Peripheral Participation, Cambridge University Press, Cambridge, MA. Newell, S., David, G. and Chand, D. (2007) "An Analysis of Trust Among Globally Distributed Work Teams in an Organizational Setting", Knowledge and Process Management, Vol. 14, No.3, pp 158-168. Preece, J. and Maloney-Krichmar, D. (2003) "Online Communities: Focusing on Sociability and Usability", [online], http://socialcomputingresearch.net/articles/preece_onlinecommunities.pdf Saint-Onge, H. and Wallace, D. (2003) Leveraging Communities of Practice for Strategic Advantage, Butterworth Heinemann, Boston, MA. Sharratt, M. and Usoro, A. (2003) "Understanding Knowledge-Sharing in Online Communities of Practice", Electronic Journal on Knowledge Management , Vol. 1, No. 2, pp 187-196, [online] http://www.ejkm.com/volume-1/volume1-issue-2/issue2-art18-sharratt.pdf. Tarmizi, H. and Zigurs, G.-J. D. V. I. 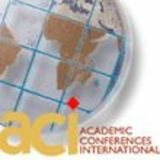 (2006) "Identifying Challenges for Facilitation in Communities of Practice", Paper read at the 39th Hawaii International Conference on System Sciences, Hawaii , 4-7 January. Wasko, M. M. and Faraj, S. (2000) "It is What One Does: Why People Participate and Help Others in Electronic Communities of Practice", Journal of Strategic Information Systems, Vol. 9, pp 155-173. Wenger, E., McDermott, R. and Snyder, W. M. (2002) 'Cultivating Communities of Practice', Harvard Business School Press, Boston, MA. rd Yin, R. K. (2003) Case Study Research - Design and Methods 3 ed., Sage, London.